* “Repo Men“: This was a horribly bloody, extremely violent, two-hour commercial for ObamaCare, and their timing is perfect right? And they made it as grisly as possible. This is set in the future. People who need organs buy artificial, high-tech organs sold by a company called “The Union.” But, since the organs are so expensive–over $600,000 in the one of the cases they show you, the people are talked into going on a credit plan. Soon, people can’t make the payments, and The Union sends out repo men to repossess the organs by cutting open the people’s bodies, taking out the organs and leaving them to die a painful death. And they hit you over the head with it. There are lots of close-up scenes of bodies being cut open. 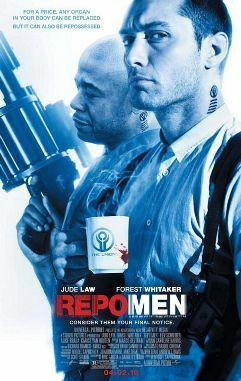 Jude Law and Forrest Whittaker play two of the repo men. Law’s wife wants him to get out of this brutal business, and before he does, he is seriously injured in one of his repo missions. When he wakes up, he discovers that he’s now one of the debtors, that an organ has been placed inside him. But he doesn’t want to go back to the repo work, because now he knows he could potentially be one of his victims. Because he doesn’t do the repo work, he falls into debt and is now one of the hunted. Like I said, it’s extremely violent and bloody–about 50 brutal homicides are shown in this thing. And it’s just pointless, other than to try to hammer into us that this baloney is what would happen to us if we have to pay for healthcare in the future and don’t have ObamaCare. It’s propaganda that couldn’t be more transparent. Sadly, to most of America’s movie-goers, they won’t get that. 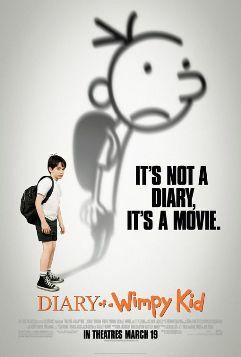 * “Diary of a Wimpy Kid“: This is based on the popular books for young kids (mostly boys). While parts of this movie were funny, most of it made me uncomfortable. Why? Well, it wasn’t just the grossness–which is fine for young boys and how they’re supposed to be–it was more so something far more important: its moral message for kids . . . or rather its message that it’s good not to be a good person. The hero of this movie is a young boy who is just starting middle school. He writes in his journal about his experiences as a kid trying to become popular at any cost. But he’s a lousy kid who has no morals, no integrity, and treats his close, loyal friends like crap, betraying them. And he gets away with it for most of the movie until toward the end. His apology for betraying his best friend and blaming a big mess he created on that friend comes late, and it’s haphazard. And he’s a jerk to most other people. He rationalizes it by saying that it doesn’t matter how he acts now because when he grows up, he’ll be rich, famous, and successful. His parents are dopes, too, kinda like many lazy and uninvolved parents these days. Is it a good message to tell kids that, like the hero of the movie, they should be jerks because it’s better to be a bad person and treat people horribly than to be unpopular in school? If that’s the message, count me out. Or better yet, count your kids out and show them something that gives them a better idea of what it takes to be a real “protagonist” and hero of the movie. 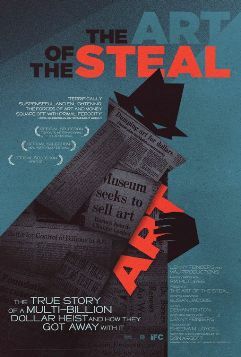 * “Art of the Steal“: This is one of the better documentaries I’ve seen lately. But that’s relative. It was a little too long and repetitive, which made it slightly boring. Still, even though I’m not into art, I found it very interesting. It’s the story of how liberals, a Black college, and prominent charities violated the express wishes dead man’s will, raped his amazing art collection, and foundation, and used over a hundred million dollars in tax money to do it. Dr. Albert C. Barnes was a multi-millionaire medical doctor who developed the drug Argyrol. He spent his life discovering modern art ahead of his time, when it was ridiculed and maligned and when the likes of Cezanne and Matisse and others were not big names. His collection, today, is valued at between $25 and $30 billion. But Barnes was a misanthrope. He didn’t like many people and had a specific idea of what he wanted done with his art after he was done. Barnes began the Barnes Foundation, which owned and housed all of his art in a special building in suburban Philadelphia. It was not meant to be open to the public, but rather for private showings to select working people and arts students who studied at the Barnes Foundation school. He never wanted his art moved anywhere else, never wanted it sold or sent on tour, and never wanted it displayed in a giant museum, especially not the Philadelphia Art Museum, which he felt was a monstrosity for rich people to show off. But Barnes a liberal was betrayed by Lincoln College, a Black school to which he was sympathetic and whose graduates he hired, Philadelphia Mayors John Street and Ed Rendell, and various socialites who took over the board of the Barnes Foundation and went to court and the State of Pennsylvania to dismantle it all and move it downtown–everything Barnes expressly opposed in the trust documents for the Foundation. And these cretins got Pennsylvania tax payers to give the multi-millions to do it, via a backdoor State budget bill measure. Very interesting, but could have been far shorter and tighter. * “Bounty Hunter“: This extremely lame, stupid romantic comedy starring Jennifer Aniston and Gerard Butler seems like I’ve seen it a million times before . . . and I have, as both of them have starred in their share of these. Sadly, they decided to repeat. She plays a reporter looking for a scoop on a suicide she thinks was murder. He plays a former cop who is now a bounty hunter. Aniston doesn’t show up for a court date and Butler, her ex-husband, is supposed to pick her up. But then, they get into a huge planes, trains, and automobile set of scenarios in which they are going to Atlantic City casinos, romantic bed and breakfasts, and are also on the road, while they try to hide from a murderer. Dumb jokes, not funny, I barely laughed, and even then, it was all relative. Slightly violent and a ton of four-letter words and not for kids. This stank. Skip it. 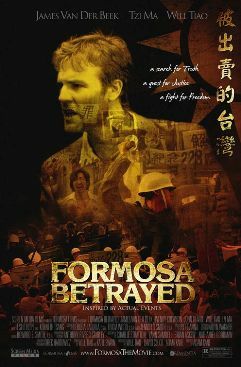 * “Formosa Betrayed“: At first, I thought this movie was interesting. An FBI agent (James Vanderbeek from TV’s “Dawson’s Creek”) investigates the murder of a Taiwanese-American professor by a Chinese drug gang. He heads to Taiwan to track the killers and help the Taiwanese government investigate. But soon he learns that the professor was assassinated by government-hired hit men because he wants democracy. This heavy-handed movie beats you over the head with the idea that Taiwan is so authoritarian it is worse than mainland China, where real oppression occurs. But Taiwan got freedom in the 1990s and is now free, so what’s the point? It certainly wasn’t to tell us history, since the movie is filled with herky-jerky flashbacks and flash-forwards of the FBI agent and a US diplomat arguing at the Taiwanese airport, along with constant lectures on the brutal authoritarianism of the Taiwan government. But, apparently, it was about digs against America and anti-Communist alliances, since there are digs at the Contras–the Nicaraguan Freedom Fighters–and claims America allowed Taiwan to oppress its people in exchange for weapons deals with the Contras. Don’t know if that’s true, but had no use for the politics of this movie. Why is Jennifer Anistan so unappealling to me. I can’t believe Brad Pitt ever took the plunge with this chick. I’d almost rather do Debbie. Plain Jen works her barely operating outside the skank zone schtick, for one more look at what her life would really be like if she did not do all the necessary hook-ups to “achieve”. Hey hollywood, how about a new thriller called…. This lineup of movies makes a strong case for reading books. “Yellowthread Street” written by William Marshall. The books take place in Hong Kong instead of Taiwan, and are well written, almost poetry. Imagine Ed McBain’s “87th Precinct” procedurals transplanted to China. Many of the books written in the 1980’s reference the future return of Hong Kong to the mainland Chinese. Good stuff. Debbie, if you “barely laughed” during Bounty Hunter, that was more than I did. I didn’t crack a smile once. I can only think that maybe this movie may appeal to women who fantasize about being Jennifer Anniston while being chased by man-toys like Gerard Butler. Lame, tedious, with a grating, pushy background score which tried unsuccessfully to act like a laugh track. Formosa Betrayed (which I saw last week) was non-stop anti-American, anti-Taiwanese propaganda. Your review was perfectly on the mark. Repo Man really was an ad for Obamacare, and also a slam at capitalism is general (didn’t the repossessions of the organs remind you of uncaring banks and mortgage companies reclaiming homes?) Pretty bad film, actually, reminding me in tone, violence, and heavy-handed liberal undertow of Saw VI. After reading your review of Art of the Steal, I’m looking forward to seeing it. I liked Diary of a Wimpy Kid. Clever, inventive, quick, bitingly satiric. I laughed a lot. The characters were ridiculously exaggerated, that’s true. The narrator who annoyed you, Debbie, was supposed to be annoying; he was a misguided egoist from start to finish and his explanations and justifications were transparent, phony rationalizations. He’s a good example of the so-called “unreliable narrator.” There was nothing in the film to show that his selfishness was in any way rewarded. This film had excellent morals but was enjoyably indirect in conveying them. Don’t you love hollywoods advertising genius. Look at the bounty hunter’s movie poster. “From the director of Hitch”. wow that’s supposed to close the deal and sell the show. Hitch sucked so why would you use that as a campaign to sell this crap. They give away just how bad it is right from the start. Jeez. What a shocker. An Aniston/Butler vehicle sucked. Movies for the brainless and retarded. Aniston’s dignity continues to drop even lower than whale caca. She just doesn’t get it. Kids already know that to be popular you have to be a jerk, especially in Jr. High; this movie teaches them nothing they already know. I wonder how many people have to turn down a role before you get to James VanDerBeek. Normally I’d like a movie that resembled something like Bladerunner. It’s as if they tried to market it like that too deceptively. Damn shame they have hijacked hollywierd to the point that even the action adventure genre is garbage packed with lefty politics. The dumbing down of America continues and we see the Idiocracy masses abound. I agree with that guy who thinks Debbie is cuter than Aniston. Brains and beauty–what a powerful combination. Yes, I too consider Aniston a horse-face. And Debbie, well I would go out with her, my treat (can’t be too easy with these chicks). Hey, before you go out crushing movies, how about you do a little research? If Repomen is an “ideal” picture of Obama’s healthcare plan…why was it copied off a movie that was released 2-3 years ago? Repo! The Genetic Opera was released in ’08 and had the exact same plot: A shady corporation gives organs to people only to have them repossessed if they fail to pay by “repomen”, and a family member of a repoman finds out and wants it to stop, only to have said repoman fall into trouble. The writer for Repomen saw an original stage production of Repo! and was “inspired” to write a movie because of it…more than 2 years later. I am sick, sick, sick of Jennifer Aniston! Do we always have to be subjected to seeing her face all the time? Personally, I’d like to see her face on a dartboard. You’re much better looking and far more intelligent than that JA character. All you guys ragging on Aniston, would you kick her out of bed? Totally enjoyed Diary movie. Although the movie was good for the younger, I took my 16 year old son and he enjoyed it also. I think you were a little tough on this movie which is done really well and keeps the interests of young and old.